Sashimi is thinly sliced raw meat but served as is and not on bed of rice like sushi. One of the most popular dishes in Japan. Fish and other sea food is basically used in sashimi preparation but there are other meat also which is used, such as beef, horse, pork, etc. Common fish used in sashimi preparation are Salmon, Tuna, Mackerel, etc. Japan is one of only a few countries that have historically consumed raw fish, they have developed detailed notions of freshness and seasonality of fish that far exceed most other cultures. 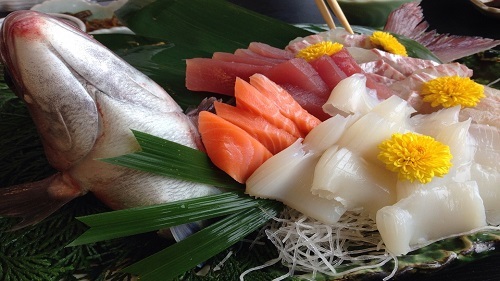 The word Sashimi dates back to 13th century (Muromachi Period), which mean “Pierced Body”. The word is believed to be originated from the rural fish farming method that is “Ike Jime” also some believe that this word came into existence in order to avoid the usage of the word “Kiru” which meant “Cut” and was only used by Samurais. Sashimi is not just any food, it’s a delicacy and an art which defines food presentation. Thin slice of sashimi is draped over a garnish which gives it an eye appeal, commonly accompanied with wasabi pate, soy sauce, ginger paste (gari), etc. 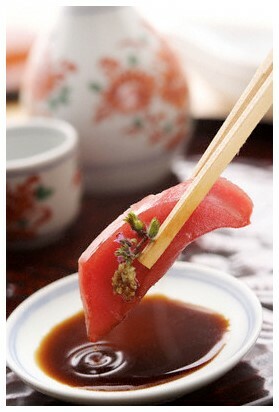 Sashimi is often served as appetizer at the beginning of the meal without any accompaniments. Sometimes it is served as main course accompanied by soup and rice. To get the best taste out of sashimi it is suggested to have it before any other dish, so that the flavor is not overpowered by other dishes. The correct way to eat a sashimi is to pick the meat with a chopstick, dip it in the soy sauce or wasabi and eat it directly, don’t bite the meat or re-dip as this is considered incorrect. Hira Zukuri- Rectangular shaped cut in standard size. Ito Zukuri- Thinner than hira zukuri, the thickness is 1/16 of an inch. Kaku Zukuri- Thinnest of all (Paper Thin), presented in pattern to give eye appeal. As with any raw food, when sashimi is eaten there is a risk of foodborne illness caused by bacteria and parasites. The important thing to remember about sashimi is that the fish should be saltwater fish, not freshwater fish. Freshwater fish may contain parasites that can only be killed by cooking. Saltwater fish do not contain these parasites and whatever parasites is there is killed during freezing process. The perfect knife for ultra-thin slicing, this sashimi knife will allow you to make paper thin slices of fish is the Bunmei knives which are traditional Japanese knives. Bunmei knives are sharpened with a one half to three quarter inch bevel on just one side giving them the ultimate degree of sharpness. The balance of Bunmei knives is also very different from western knives. 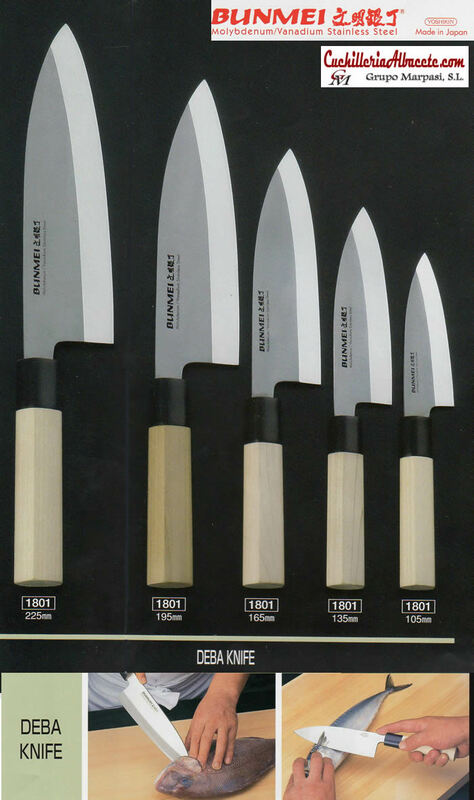 Bunmei knives are made of a high carbon stainless steel and also contain molybdenum and vanadium giving them excellent edge retention. The following are some of the more common types of sashimi that travelers are likely to encounter during their trip in Japan. Most of them are available nationwide and year round. Maguro is found at virtually all restaurants that list sashimi on their menu. Most parts of the fish are eaten. The most common is akami, the deep red loins of the fish which are lean, firm and meaty. Higher up on the scale is toro, the pink, fatty belly meat, which is especially prized for its rich, buttery flavor. Toro usually comes in two grades: chutoro (medium) and otoro (premium) depending on the fat content. Some of the most prized tuna are caught off Cape Oma at the northernmost tip of Aomori Prefecture. Also called as Chutoro, Akami, Otoro. Sake is another fish that is popularly served as sashimi. Its bright orange flesh is tender, fatty and delicious. Sometimes you can find salmon toro on the menu, which – like its tuna counterpart – is the fattier belly portion of the fish. Tai, with its mild, subtle flavor, is considered one of the top white fleshed fish in Japanese cuisine. Tai is often served in times of celebration, such as at weddings and during the New Year. Though more popularly served grilled, saba is also enjoyed as sashimi when in season. Its oily flesh gives it a smooth, meaty flavor, which goes well with green onions and grated ginger. The oiliness also makes saba spoil quickly, which is why the fish is often preserved by lightly pickling it in vinegar to cut down on its fishiness and help it keep longer. The resulting dish, called shimesaba (as shown on the photo to the left), has a light, vinegared flavor. A central ingredient in fish stock (dashi), the katsuo is one of the most important fish in Japanese cuisine. Katsuo may be served as sashimi, but is more commonly eaten in a sashimi-like dish called Katsuo no Tataki, in which the katsuo loin is lightly seared around its edges, sliced, and served with a citrus based sauce together with garnishes such as garlic or grated ginger. Kanpachi is a type of yellowtail that is commonly served as sashimi. Kanpachi looks very similar to buri (see below) except that it has a lighter, even more translucent color. The fish, which is lean and mild, is at its best in early summer. Closely related to kanpachi (see above), buri, also known as hamachi, is another commonly served yellowtail. Buri’s translucent, pinkish white flesh has a high fat content resulting in a rich, buttery flavor. Buri is available year round, but considered best in winter. Fugu is the Japanese word for Puffer fish and the dish prepared from it is also called Fugu. Fugu can be lethally poisonous due to its tetrodotoxin; therefore, it must be carefully prepared to remove toxic parts and to avoid contaminating the meat. The restaurant preparation of fugu is strictly controlled by law in Japan and several other countries, and only chefs who have qualified after three or more years of rigorous training are allowed to prepare the fish. Fugu is served as sashimi and Chirinabe. Some consider the liver the tastiest part, but it is also the most poisonous, and serving this organ in restaurants was banned in Japan in 1984. Fugu has become one of the most celebrated and notorious dishes in Japanese cuisine. Other fish which are served as sashimi are Japanese Horse Mackerel (Aji), Fatty Tuna (Otoro), Whale Meat (Gei-niku), Sea Bass (Suzuki), Eel (Unagi), Sea Bream (Tai), Pacific Saury (Sanma), Katsuo (Bonito), Dolphin, etc. Ika is one of the most common types of seafood served as sashimi after tuna. While the squid’s legs are usually reserved for other dishes, the translucent white flesh of the ika’s mantle has a firm texture and a mild flavor. Ika sashimi is sometimes served in a style called ika somen (as shown on the photo to the left), where the flesh is cut into thin strips that resemble noodles. Tako is another typical item in Japanese cuisine; the tentacles are often thinly sliced and served as sashimi. Tako may be eaten raw, but is also commonly poached first which gives the flesh a sweeter flavor and firmer texture. Of the various kinds of shrimps eaten in Japan, the one most commonly served raw is amaebi (sweet shrimp). Amaebi have a sweet, subtle flavor and are usually presented with most of the shell removed except for the tails, which some people eat. Some places that are famous for their amaebi include Niigata and Hokkaido. Ebi refers to a style of preparing shrimp in Japan. In this method the shrimp is you prepared by “Butterflying” them- That means splitting the shrimp from the bottom and laying out flat. Hotate are one of the more prized shellfish in Japanese cuisine. The best hotate have a firm texture and a sweet, almost creamy taste. While it is common to serve the scallop’s thick, white abductor muscle alone, some restaurants also serve its viscera, the sharp bitterness of which contrasts nicely with the smooth, mild meat. Hokkaido and Aomori produce some of the best hotate in Japan. Hokkigai is one of many types of shellfish that are eaten as sashimi. The triangle shaped foot of these clams may be served raw, but is more commonly lightly boiled which turns the tip red and firms up the meat. Best in winter, good hokkigai have a meaty texture and sweet flavor. Many are harvested in the northern regions of Japan such as Hokkaido and the Sanriku Coast, although these days a lot of hokkigai are imported as well. Other shellfish which are served as sashimi are Abaloni (Awabi), Cockles (Tori-Gai), Aka-Gai (Red Clam), Crab (Kani), etc. A type of caviar, ikura is cured in salt or soya sauce. The translucent, bright orange eggs are each about the size of a pea and have a rich, salty flavor that bursts in your mouth as you eat them. Some of the best ikura comes from Hokkaido. Uni is a particularly prized (and expensive) delicacy in Japan. The yellow to orange colored roe has a rich, buttery texture, and a sweet, briny flavor reminiscent of the ocean. Some of the best uni comes from Hokkaido. Rare delicacy, meaning “many children”. Golden colored, crunchy and rubbery texture. Beef with thin ribbon fat served raw as sashimi, eaten shiso leaves and with Ponzu– Soy sauce and vinegar seasoned with salt and pepper. Other beef sashimi are beef tongue, beef tripe, beef liver (rebasashi). Raw liver of cow served with chopped green onion and soy sauce seasoned with grated garlic. Raw horse meat, pink in color, served with grated ginger, daikon, shiso, and sweet shoyu. Other parts such as tongue, heart, liver are also served. Also known as “the other pink meat”. Raw breast meat served with soy sauce seasoned with truffle oil. The meat has to be fresh and proper care should be taken while fabricating so that it doesn’t catch any bacteria. Other parts of chicken are served as sashimi such as liver with sesame oil, thigh meat with seasoned mustard sauce, gizzard with grated ginger, etc. Pork sashimi is made from the Kurobuta Pork– Highly prized pork in Japan which comes from the Black Berkshire breed. The sashimi is served raw after cutting the meat into thin slices, served with mache, dashi jelly, and seasoned caramel sauce. Red colored meat of deer served raw with, grated ginger, garlic, leek, celery and soy sauce or wasabi paste. There are other animal and bird meat which are eaten as sashimi such as Frog, Sea Turtle, Duck, etc. This is very delicious cooking. kitchen knife is very needed for cutting anything dish item. Thank you very much for sharing this post.